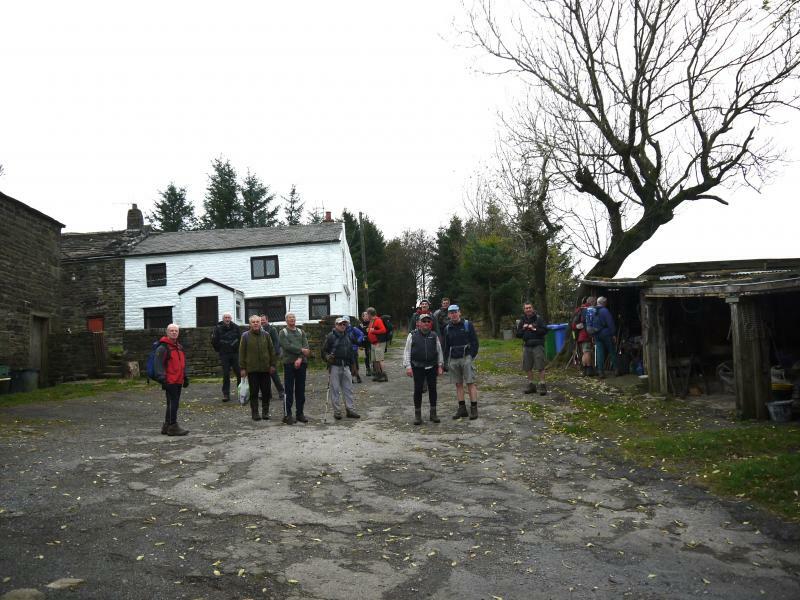 Twenty one walkers met at Norden terminus for the start of the Last Tango In Halifax jaunt. Only nineteen set off as Roy had an infected leg due to a beasty sting, so he and his friend thought it best not to walk. Late-comer Neil met us on Blackpits Road after Maureen saw him on Edenfield Road and brought him in her car to join us and make the number up to an even twenty. We made our way past Mill Croft and upwards to Ashworth Moor Reservoir passing Marcroft Gate Farm. 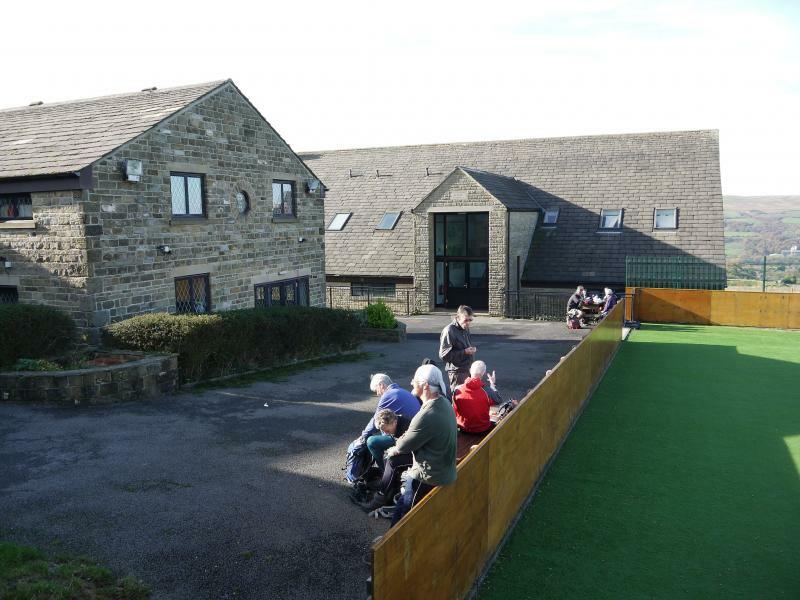 We passed the Owd Betts pub and walked by the side of the busy A680 until we turned off towards Rossendale School, where, after getting permission from the caretaker, we used the School’s picnic tables to have our first drink stop. After refreshments we made our way to join the Rossendale Way, crossing the road to the stile which is situated on a very bad bend on the main road. Once safely across we made our way above Fecit Farm on the old Coal Road which skirts Whittle Hill and Scout Moor passing the enormous wind turbines. 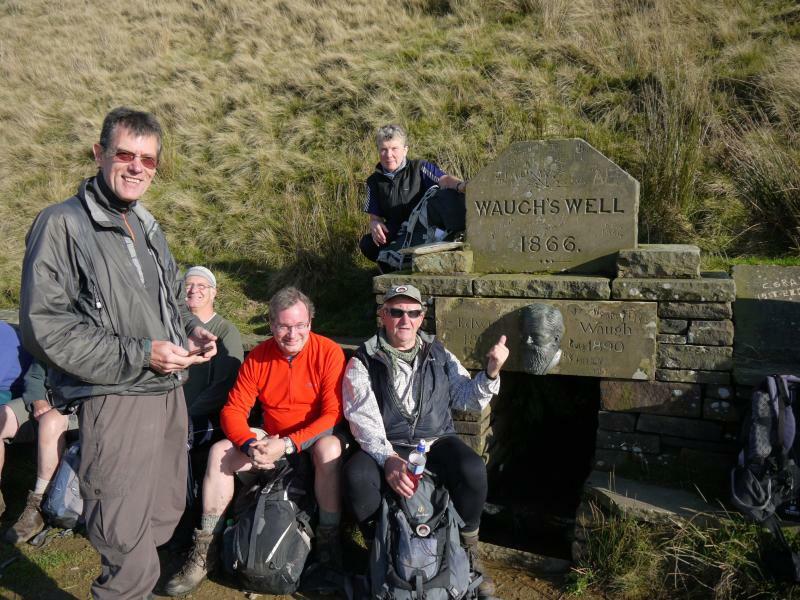 We reached Waugh’s Well, which is the half way point of the walk about 1 pm and sat down to enjoy our packed lunches in the beautiful sunshine overlooking a reservoir which doesn’t appear to have a name. After leaving Waugh’s Well, we visited the ruins of Fo Edge where Edwin Waugh did quite a lot of his writing. 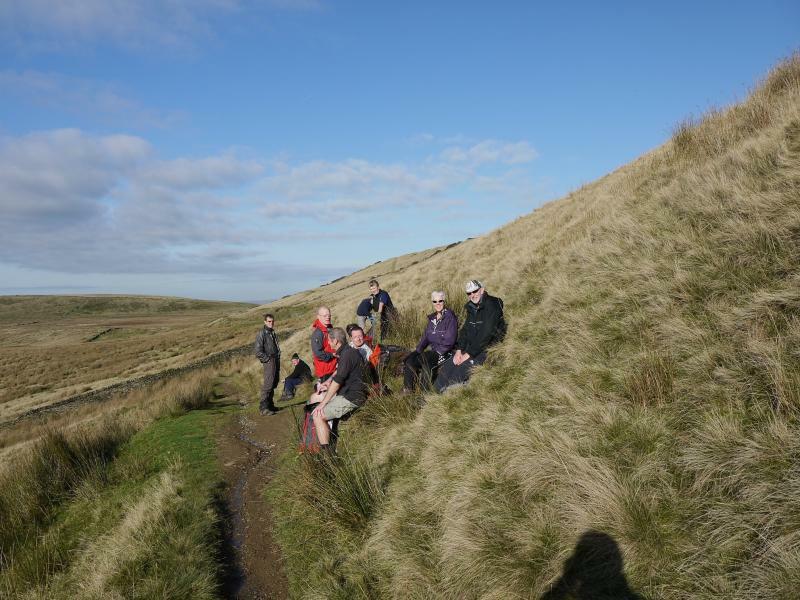 We then made our way upwards, still on the Rossendale Way overlooking Cowpe Reservoir and the Rossendale Valley towards Stacksteads and Bacup. After passing Top o’ Leach we joined Rooley Moor Road which we stayed on for a couple of miles and then took a path to the right passing Warm Slack Hill to meet the path past the Water Board house, down to, and crossing the Lower Naden Reservoir dam and climbing up to Knowl Farm which is the location for Gillian’s farm in the television drama ‘Last Tango In Halifax’, hence the title of the walk! From here it was all downhill where we crossed the Greenbooth Reservoir dam and walked down to the Doctor Dam fishing lodge and back to Norden. Most of the group went in The Bridge Inn for a welcome drink and chat. 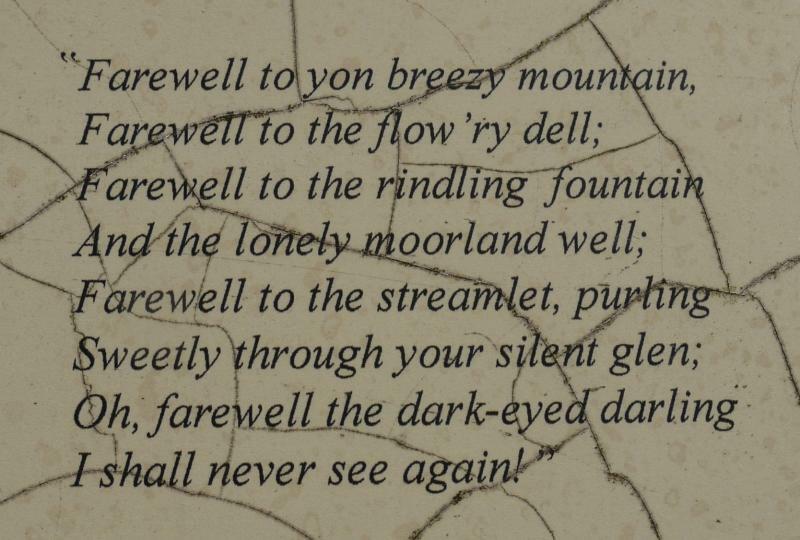 After a very pleasant day with beautiful weather and good company on the moors above Rochdale we departed on our onward journey home around 4.30 pm. Thanks to all who joined me on the walk, which I hope you enjoyed. We met up in Chipping car park to catch the coach to Bolton-by-Bowland and we were on the hoof around 9.10am. We set off with very poor visibility due to low mist which stayed with us for around 2 hours. We made our way via fields and road to Tosside where we had a morning stop. For those who wanted it, the local pub was open serving flapjacks and mugs of tea! We then moved on into the Forest of Gisburn where we encountered a lot of mountain bikers on the main forest tracks. We then went by the side of Stocks Reservoir with fantastic views of the Trough of Bowland before we made our way by field and tracks to Slaidburn for our lunch stop. The local tea room was very busy serving all sorts of snacks. Thankfully by now the sun was out and it was very warm and pleasant. After lunch we made our way by riverside paths and tracks before going over the small suspension bridge across the River Hodder into Dunsop Bridge. We stopped here for an afternoon break before setting off with the weather still sunny and warm and very pleasant for mid October. We had a slight climb and then went into small forest plantation with many fallen trees to climb over and under. We were all experts in the limbo by the time we left this area! (NOTE: the fallen trees are a known issue and it is hoped they will be removed in time for the main event). We then continued by fields and tracks and on the way we spotted a hot air balloon in the late evening sunshine. We then had a final descent on tarmac into the village of Chipping were we finished about 6.00pm. A long day but very rewarding. Photos by Brian Fisher in a google plus album. I recommend you run them in slideshow format in full screen. After meeting at Ryelands Park in Lancaster, our coach took us to Silverdale to start the final stage of our walk around the countryside of North Lancashire. Our route on leaving Silverdale was south to reach the beach at Jenny Brown’s Point and the remains of a copper smelting mill where copper and tin were mixed to make bronze. It’s here at Brown’s Houses that the right of way has been illegally diverted onto the beach for the last 20 years.The Peak & Northern Footpath Society in currently fighting to reopen the path. The route then crosses the flat grassland known as Quakers Stang,before a steep climb to the top of the 490ft Warton Crag. After a steep descent, we reached the village of Warton with its connections to the Washington Family and someone called George? After passing near to the railway station at Carnforth the route followed the shore of Morecambe Bay to reach the promenade, passed the statue of Eric Morecambe to arrive at the art deco design of the Midland Hotel. The final 3 miles followed an old railway line known as the Lancaster Greenway to reach the River Lune at Lancaster and then crossed Ryelands Park to arrive back at our cars. The East Lancs group had a good excuse to fit in an extra social trip this year – the significant birthdays of two members, who won’t remain anonymous! Forty three people joined in the celebrations. As on the group’s annual South West Coast Path jollies, we arranged the holiday through Alfa Travel of Chorley. They are now well versed in the requirements of a bunch of walkers who want to do linear walks, and some non-walkers who want to sightsee and shop, thus keeping everybody happy. The Hydro Hotel in Llandudno provided good value accommodation right on the promenade and close to the town centre, with views of two of our objectives for later in the trip – the Little Orme and the Great Orme, though some chose to walk up the Great Orme on the Saturday afternoon when we arrived. The evening saw us celebrating Norman Thomas’s (Stormin’ Norman) 75th and Viv Lee’s 60th birthdays, both of whom have stretched their birthdays like a pair of well worn tracksters this year! Three days walking were planned, with the precise itinerary decided on a day to day basis depending on the weather forecast. The emphasis was on quality rather than quantity, though what was lacking in distance was certainly made up in ascent. Norman’s heart’s desire was to conquer Snowdon again, so with a decent (ha!) forecast for the Sunday, we were dropped off at Pen-y-Pass car park to ascend via the Pyg Track, with the option of tackling the Crib Goch ridge on the way. It being a mountain, the weather didn’t do what it was told and it became cold, wet and blustery, but undeterred we pressed on and reached the summit, at 3,560 feet, 2 hours and 20 minutes later. We enjoyed the excellent summit café and visitor centre with its panoramic windows giving, errrm, panoramic views of the mist. The Crib Goch contingent kept us waiting an anxious hour or so longer and arrived to cheers, and calls of “well we’re off now!” The Rhydd Ddu path was followed down in the mist (which hid the vertiginous drops in the early stages) until good views emerged to give us a splendid finish back down to the coach pick up. We were joined by two local members for the Monday walk from Aber, and they had no problem in tackling this hilly route. 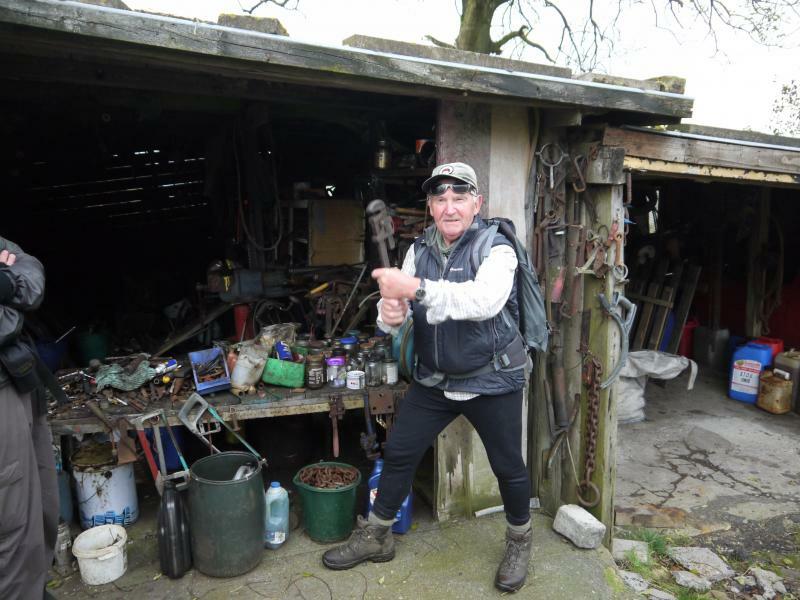 The North Wales path was followed for much of the way, which our leader for the day, Chris Langabeer, had done some years previously. The start of the walk was delayed for ten minutes due to an unexpected downpour. After walking 200yds we then had a 200m climb to obtain our first view of Aber Falls, which were reached a mile further on. Due to the earlier heavy rain the Falls were a magnificent sight and the subject of many photos. Onwards we walked downhill. Now we all know what comes after downhill. Its uphill, which led us on to a high plateau giving us excellent views that included Anglesey and the Menai Straits. We eventually walked just below the summit of Moelfre which at 435m is the highest hill on the North Wales Path. The weather was good for much of the day, and progress was steady, apart from a certain member, who shall remain nameless, having to backtrack a mile for a mislaid GPS! The last climb of the day was reached as we ascended Conwy Mountain with its views over the Conwy Estuary and the town of Conwy. You really now could roll a ping pong ball all the way back to the coach which was reached at 5.10pm after a walk of 16.5 miles and 3200 ft of ascent. On arriving back at the hotel several members of the group went into the bar to have a glass of lemonade!! The total ascent was 3,200 feet with a distance of 16.5 miles. The seafront at Colwyn Bay was our starting point on our final day of walking. The beach was being ‘improved’ with sand imported from Saudi Arabia apparently! Sadly the derelict pier was showing no signs of being revived. We pressed on in the rain and regrouped at a headland, where sharp-eyed Viv spotted a seal not far off shore. We battled on up to the trig point at the top of the Little Orme in poor conditions, then headed for Llandudno. Some people (who shall remain anonymous!) couldn’t resist the temptation of hot showers, hot drinks and maybe even the bar of our hotel as we passed by, but the more stoic amongst us carried on to tackle the summit of the Great Orme, which means sea serpent apparently. Norman found his true vocation when we visited St Tudno’s church en route, which has an outside pulpit with seating. Refreshed from the café, the descent took us via delightful terraces back into Llandudno, where yet more refreshment of a beery nature was had in the Weatherspoons, located in the impressively converted Palladium. History was made when Norman stood the round! The total ascent was 2,723 feet and the distance for the day was 12 miles. We ended the trip on Wednesday with hearty breakfasts and, after saying farewell to members who had travelled by car, boarded our coach to return to Burtonwood services by 11.00 a.m. for the feeder transport back home. An excellent trip all round, with many thanks to the walks leaders Chris and Norman (plus assistants), and to John Bullen for pulling the whole thing together.